Two movie stars in evening dress lean in for the kiss. The air is scented, the music quivers and mounts. But just as their lips are about to meet, the moment is blocked by a quite different view – of a river at the bottom of a deep dark gorge, flowing away towards a distant light. A sepia postcard has been glued to a 50s film still: romantic landscape, romantic movie. That is the work; the method is simple. But the alignment is so skilful that one is able to hold two (and more) opposing perceptions at once: the lovers about to kiss, evident though their profiles are occluded; the prospect of passion welling up in the darkness; but also the exact opposite: two cliff-faces opposed, blocked, never to meet, with no release. Look into the image and it deepens; look, and you see through it to another side. 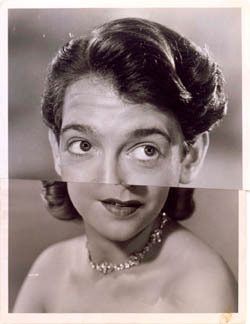 Pair IV is a collage by the English artist John Stezaker. Its impact clearly comes in part from a lucky strike, the persuasive coincidence of jaw and cliff, eyebrow and foliage, the light in the room and the light in the landscape. 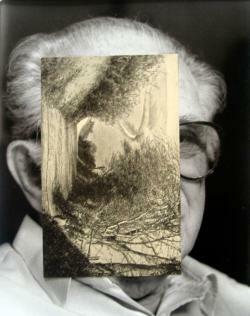 Stezaker has shuffled his numberless pack of images and hit upon a perfect match. 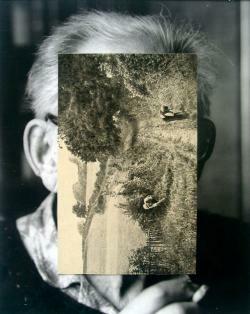 But idea precedes experiment, and for 30 years or more Stezaker has been pondering visual incongruity, inverting, rotating, slicing and splicing pairs of old images to create new works of art. His juxtapositions are anything but seamless – colour/black and white, male/female, portrait/landscape – precisely so that the eye is confronted by obvious disunities that the mind must somehow resolve. Sometimes the idea is so simple one marvels, above all, at the strange effects. Stezaker removes the top half of a starlet in jodhpurs and her braced legs appear inexplicably monumental. He crops Big Ben so that the clockface is tiny against the glorious frame-filling sunset above, time mocked by mere elements. He nips and tucks: one film star is blinded by the excision of a narrow strip across the eyes; another becomes bug-eyed by the doubling of this strip, which also gives the collage an optical shudder. Two 50s children sit uncomprehending before an adult almost entirely obscured by a blank white screen. The scenario appears irresistibly comic, something like the dog in the famous New Yorker cartoon that perceives nothing but gibberish in its owner's speech-bubble, except this humour is tinged with horror. Innocent eyes, the dawn of the television age, the tyrannical adult bearing down like Big Brother: it's all there in the pale glow reflected in their faces. There is only one (incised) image here, a movie still carefully selected for its well-placed window, true source of that glow. 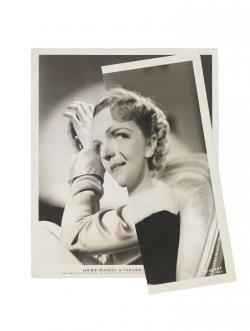 But sometimes the art arrives more serendipitously, as when Stezaker cut a film star out of a fanzine, then discovered that the actress on the back was now trapped in a tense double-act with a black silhouette. Dark Star, he called that series. 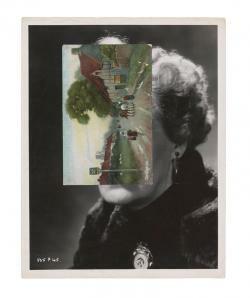 But Stezaker mainly works with two found images: postcards masking faces or hovering above them like ideas; silhouettes crammed with fantastical pictures; male-female hermaphrodite faces. These are his weakest works, a dilution of the surrealism to which he often alludes. 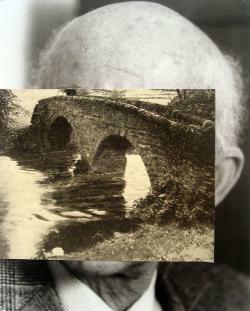 Freud's photograph hangs above the couch as a postcard train rushes out of the patient's head: Magritte reduced to the absurd. Stezaker's work has been extensively theorised in terms of popular culture, signs, signifiers, surrealism, early Hollywood and advertising history. Some of his admirers are even obsessed with the one thing he isn't interested in at all, namely the source of his images. But the strength of his best work, it seems to me, comes from something older than the original photographs: a Romantic wildness. It's the starlet teeming with bat-wheeling visions, the lighthouse in the silhouetted head, the mother at the child's bedside, both obscured by the postcard of a lonely country lane opening up like a new story between them. Enchanting, vertiginous, darkly humorous, disturbing, the effects are masterfully achieved. Nature is matched to man, landscape to portrait with absolute precision. Waterfalls for eyes, pools of thought, the canyons of the mind: Stezaker makes metaphors visible. 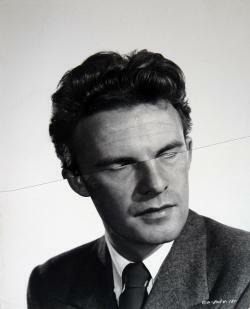 An anonymous actor sits blindfold at a desk. Just above him, like an inner vision, hangs a postcard of an old castle shattered by waves and storms. It is Chillon, the prison in Byron's great poem, but it belongs to this Everyman too. Dark, mythic, rising straight out of his sightless head, this fearful image passes straight into your own. 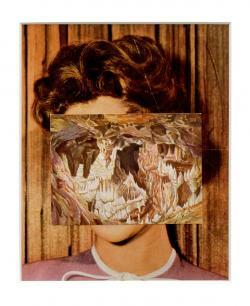 Stezaker's collage is a modern Sleep of Reason, the mind haunted by free-floating images. When Andy Warhol asked 60s stars to pose on film for four minutes, some stood stock still as if for an old-fashioned portrait, while others broke into nervous tics or laughter within seconds. Those who knew the sitters were regularly amazed, though, because their reactions were always so characteristic. Do moving portraits have unfair advantages? This question is constantly in play at the De La Warr Pavilion's riveting new show. Motion and narrative, the subject shown in time, in the round and in their own words: the genre seems to have a head's start. 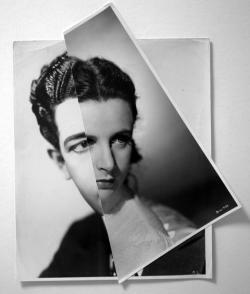 John Stezaker is a self-confessed vandal and thief, but he has a huge retrospective at the Whitechapel Gallery. How did this master of collage make good? BJP reports. 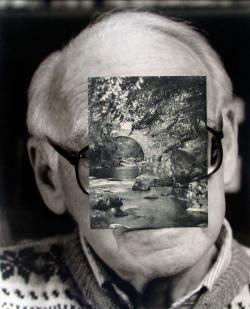 John Stezaker says he sometimes feels guilty about 'abusing' found photographs - but he's been at it for 40 years and now has a huge retrospective at the Whitechapel Gallery. What's he playing at? BJP interviewed him to find out more. BJP: How did you get into collage? 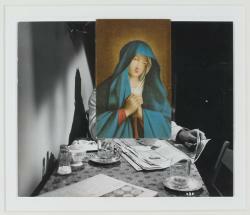 John Stezaker: My mother has always been horrified at how my work emerged out of childhood vandalism. I was into it from the beginning, seemingly. I cut up and defaced books, and was regarded as very naughty for doing it. I do still feel that guilt, there is something very peculiar about taking a scalpel which was invented for surgical purposes and cutting across the emulsion of a photograph. I don’t know why I felt it was necessary. It shocks me sometimes how violent my early work was. But you can only get a feeling of the inviolable purity and sanctity of the emulsion of a photograph by violating it. Then I had a teenage collage phase, but not with photographs. 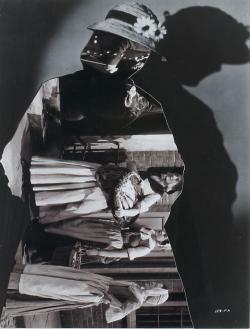 I made my first photomontages at the Slade in 1968, in my second year at university. I had started getting interested in photography in the first year, then I stopped painting and started collecting and using photographs. I made collages with images cut out of shopping catalogues. Unfortunately I don’t think any have survived – I tend to leave things in places and they get lost. But I think they’re very powerful, lost images, because you fantasise about them. One I remember very fondly was fragments from backgrounds of adverts in a grid; in another I used shopping catalogues, taking carpet samples and putting them into grids like Mondrians. That was very funny, I wish I still had that. I did have a point where my work was quite political, maybe because of the Situationists, especially Debord. I used to get hold of the Situationist International and shake, it was so inspiring. My French was terrible so I couldn’t really understand the writing, but I got the idea from the images. I thought this reuse of images was really fascinating and for a while I thought ‘This is it, forget all this art stuff, it’s political’. But it didn’t last very long. I started to find it unsatisfactory because the moment you put a word on an image, you deny it as image. They look like colour supplements, the image dies. Only when I took the word away completely in 1976 was I able to start again. All the work I did before that I tried to destroy. BJP: Peter Kennard [who’s also well known for political photomontage] was at the Slade at the same time as you, how much do you think you have in common? 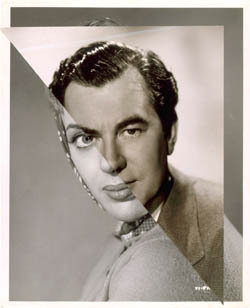 John Stezaker: I love Peter and respect him but I have a real problem with political photomontage. I did a piece on it called Heartfelt [a play on John Heartfield, the German photomontage artist] and it was my critique of political photomontage. Political photomontage is doing exactly opposite of what I see collage as doing. I always used to make a distinction between montage in a sort of Eisensteinian sense [film-maker Sergei Eisenstein], and collage, which I saw as more a kind of Vertov scene [film-maker Dziga Vertov], a kind of showing of the seams as opposed to a kind of seamlessness. To me, montage approaches the world of photographic images as if they’re kind of particles of speech, and tries to combine them as words to make meaning. My position is the opposite, it’s about the total illegibility of images. That’s the threshold between these two approaches. Klaus Staeck, the German equivalent of Peter, ended up producing government propaganda, and that’s my problem with political photomontage in the end – it’s only ever about power. For me there’s a naturally subversive power in the image, and the image in our collective cultural subconscious. There’s so much imagery around, but it’s always tied to narrative, pre-eminently in cinema where there is no way we can approach the image any longer without it being tied to the speech, the auditory. Silent movies are a real last moment for cinema as image, since then it’s been a sort of imagery that’s consigned to an unconsciousness – the shots are shown so quickly, at 24th of a second, that we can’t consciously retain them. And all the multimedia that’s around now, to me that’s montage. Everything is montage, we live within a montage, and to me that’s terrifying. A lot of people have declared this, from Lefevre to Baudrillard, this kind of dematerialisation of our experience. We’re in a sea of all that communication. I’m a Luddite really, trying to live out the rest of my life within a mechanical pathway. BJP: Do you think collage is a way to slow those images down and make us more consciously aware of them? 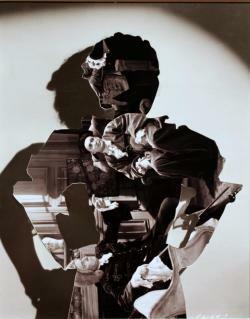 John Stezaker: It’s partly to do with that, but it’s also about another kind of momentum, which is the imaginary projection, the movement of the imagination and the sort of flight that can be found in images. BJP: How do you choose the images you work with? 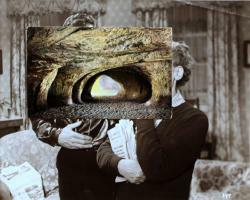 John Stezaker: I have no answer, it’s almost the reverse – how do these images choose me? At the moment I’m experimenting with the idea of doing collages in books, so I’m Ebaying. That started in an Oxfam shop with a man called Carol Becker, a Czechoslovakian photographer. I have a regular round of second hand bookshops around Hampstead and I kept finding his books on Prague, all hand dedicated. I realised he must have left Czechoslovakia when the Russians moved in and come to Hampstead – a lot of Czech Jews settled in the area. It all made sense. He became the source for a huge body of work I’ve been working on for 20 years called The Bridge, combinations of topographical images of Prague. Going into a charity shop or second hand bookshop, there are moments when I see an image and it seems like the strangest thing in the world. It’s a kind of sighting. That experience is the key thing for me, that moment when an image is showing itself not in terms of its relationship with the everyday world, its context, but showing in its mysterious other aspect. That’s what I try and follow, that quality. I don’t quite know what it’s about. It’s not choosing the image, it’s what the image is finding in me. Or rather, it’s impersonal – I enter into an impersonal realm. I often used to use the metaphor of orphans – images in charity shops are like orphans, they’ve lost their context or culture, they’ve gone a little bit out of date. They’ve been neglected and overlooked for years and people have passed them by, then suddenly here I am, the alternative foster home but unfortunately I then inflict terrible abuse down in the basement where I cut them up. BJP: Why have you worked so much with certain types of found imagery? 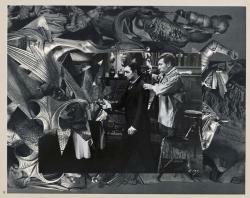 John Stezaker: It is partly personal – I grew up around those images. I was drawn to sepia, which wasn’t a colour of my childhood but which is the colour of things that have been consigned to cupboards, old things. I often think the Second World War changed very thing. Pre-war everything gravy-coloured, post-war everything was primary colours because it was America. I was brought up within that new culture and have explored that with collages I’ve done with Ladybird books – there is very interesting colour coding, which is pure American. I’m very interested in that shift. But I also have this other side to me that’s interested in the time before, and my Third Person Archive centres on my grandparents’ era. I see it as a familial thing. A lot of my more recent portrait images are about the shift from old to young, and it’s obvious why – I’ve reached that age. That’s quite explicable as a preoccupation. I collect postcards of the same place – Big Ben from 1900 to now, for example. I like particular strange corners of provincial towns, a roundabout or a canon that appears and disappears. I’m fascinated with the 1930s and 40s because it was the height of the cinema. It was the great age of cinema, but there was this total dichotomy between the war and depression and all the rest of I, and this fantasy [the world of the cinema]. It was the first time we started to live in that schism in media culture, the first time we were being pulled in two directions. Somehow I missed that with the TV. It’s the two war machines, in Paul Virilio’s terms, it’s the cinema bombarding us with a machine gun of images and it’s the actual war. It was strangely a mythic time. My parents only started to talk it about later – in the 1950s it was very much “Don’t talk about it, start afresh. But the shadow was there in that sepia-coloured world – what happened. A lot of what I do is trying to see the world as a series of ghosts. That’s the only way I can explain it, but it does seem to have an urgency in the present. I have a certain horror of nostalgia, for me it’s a very current concern. There’s a certain horror with the past. BJP: Are you interested in the online dissemination of images? 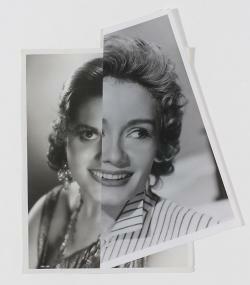 John Stezaker: Only in a negative sense, a kind of horror. It’s very attractive to do things instantaneously, but everything gets absorbed into activity on the computer. Everything becomes communication and montage, drawn into this space of multiplicity. It’s fascinating, and it’s a prison. I see collage as a way of trying to find some seams and fissure. BJP: How do you feel about showing your work in galleries? 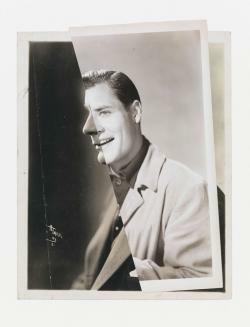 John Stezaker: Very happy. I find the idea of my work returning to popular culture totally irrelevant, a total subversion of what I’m trying to do. I see signs of it here and there – I can point out advertising campaigns that have been clearly influenced by things I’ve done. I don’t like it. Its funny isn’t it, here I am appropriating madly but I don’t really like it when people appropriate my work. Most conceptual art tries to reduce the gap between everyday life and the gallery, I want to reinforce that distinction. I think we’re losing the sanctity of these places because of communication. The National Gallery is one of my favourites, but I almost don’t like going there any more because of the buzz of communication and people marching along listening to headsets. I like museums to be, what did Gide call it, spaces of polished solitude. I remember them like that, now they’re very busy and I don’t like that too much. The space of the gallery, a space separated from life, is very important to me and I want to preserve it. But it’s not that I want to be comfortable there - I want to bring out that morbid, deathly pursuit. I think all my favourite artists have had this concept as the museum as the place of death. And so, for no very good reason, to Meret Oppenheim's fur-covered teacup, Object. How does it work? In the functional sense, presumably it doesn't. Oppenheim has taken two markedly proper commodities – teacups and fur – and run them together to make a third, improper one: the phrase "drinking from the furry cup" might have been coined for Object. Like all surrealist artworks, the power of this one lies in its coincidence of inappropriate things, and that in turn relies on time. See a Chinese gazelle's hide and then, a moment later, a teacup and you will not turn a hair. But see a gazelle-hide teacup – a gazellehideteacup – and you might find yourself retching. 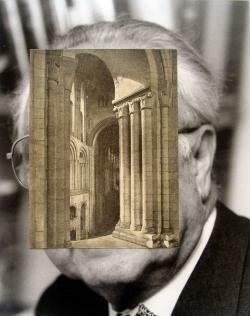 John Stezaker makes collages out of found images, mostly old film stills and studio publicity shots, sometimes with the addition of vintage postcards. Like Oppenheim's teacup, his work depends on coincidence and its Freudian friend, accident. 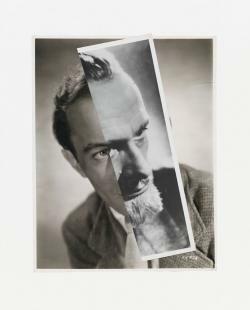 As with Oppenheim, too, you might reach for the word "Surrealist" to describe Stezaker and his art, although Object was made in 1936 and the earliest work in Stezaker's one-man show at the Whitechapel dates from 1976, long after Surrealism's heyday. There is probably an -ism to describe what he does: neo-Surrealism, perhaps, or post-neo-Surrealism. As Molesworth might say, I neither kno nor care. 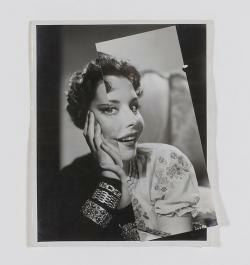 There are other, more important words to apply to Stezaker's work, among them "elegant", "cunning" and "uproarious". 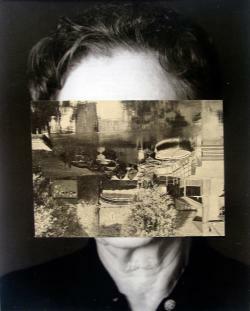 Take this one, from a series called Marriage (Film Portrait Collage) and made in 2006. 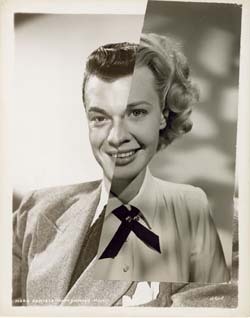 Stezaker has taken two black-and-white studio photographs from the 1950s, one of a man, one a woman, cut them diagonally down the middle of their subjects' faces and stuck them back together. Simples! Well, yes and no. 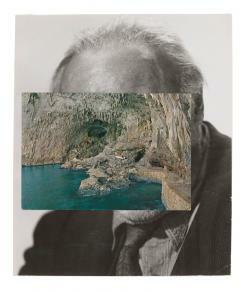 In terms of cutting – a big part of the collagist's work – Stezaker is oriental in his simplicity. There is the single slice, made, at a guess, with a craft knife, the collaging of two parts only. Where the work comes in is in the looking: in Stezaker finding the images and somehow keeping them all in his head, remembering how big they are and how saturated, what angle they were taken at, how they will slot in technically. And that is before the whole question of what will emerge, in emotional terms, from putting them together, how appropriately inappropriate they will turn out to be. In the case of this particular Marriage, what hits you is its worrying beauty. The man and the woman are individually lovely, but the troubling thing is that their beauty is the same. Seen as one, she is revealed as strong and handsome, he as lush-lipped and feminine. This is less a marriage than a genetic splicing, a teacup of fur. Beyond that again is a story, unspoken but none the less told, to do with inconstancy, the tendency of all things to slide. 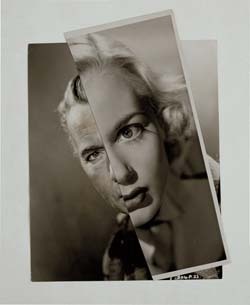 One suite of Stezaker's collages is called Betrayal, apparently based on a complaint common among male-to-female transsexuals that their hands give them away. The images in this suite are accordingly full of hands. But Betrayal would make a good working title for all of Stezaker's collages, their juxtapositions betraying all kinds of unsaid things. What really brings you up short is the ease with which Stezaker seems to do what he does. My wordy paragraph above described one slice of his Stanley knife. That, though, is positively baroque compared with his pasting of postcards to publicity stills. 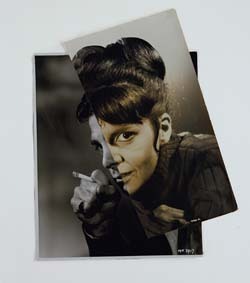 Here is one called Pair IV (2007), in which Stezaker has stuck a postcard of the Aar Gorge over the shot of a pair of suavely dressed movie stars, presumably gazing into each other's eyes. The gorge's two cliff-faces become the faces of the actors with such ridiculous accuracy that, as often with Stezaker's work, you find yourself guffawing out loud. It is like the unpicking of a metaphor of love, some cheesy, Hollywood line to do with elemental forces and the earth moving, chasms being bridged. You can almost hear the violins. 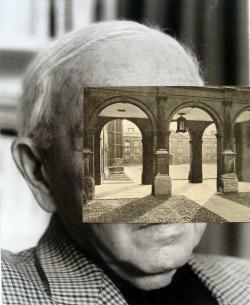 But there's something there as well as humour, as well as Stezaker's uncanny eye for visual coincidence. The oddest thing about Pair IV is that you feel it is strangely revealing of something, although it is impossible to say quite what. And so with Love X, in which a pretty starlet's face has had another slice of itself inserted across the eyes, so that each pupil is a pupil-and-a-half. It looks like she is batting her eyelids, or maybe as though the film has jumped on the projector. It's funny but also sad, heartfelt but very, very clever. Do see this show. Stezaker has been centrally influential in a number of developments in art over the last three decades; from Conceptual Art, New Image Art through to the contemporary interest in collage. 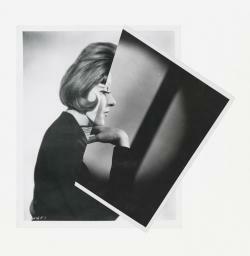 Showing first as a part of the British Conceptual Art group in 'The New Art', 1972 (the first Hayward Annual), Stezaker's interest in the concept soon gave way to a long-term fascination with the image, finding new aesthetic allegiances with the image through working with found photographs and printed matter. This fascination is translated into alterations, deletions, visual concordances and juxtapositions of disparate sources, intuitively creating new images, relationships, characters and meanings. Stezaker's investigations continue to develop in this exhibition of new works that concentrate specifically on the portrait. 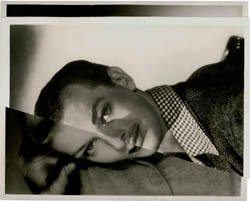 In the 'Love' series, subtle but masterful alterations to found original film star portraits shift and magnify emotion and expression that had before only been implied, sometimes imperceptibly, in the original image. The glamorous and carefully posed faces are subtly transformed into otherworldly, uncanny beings. Stezaker's simple yet disconcerting modifications toy with the subconscious and the surreal. His permutations produce a 'moment of revelation within the universal blindness that the consumption of images has become: a glimmer of consciousness within the unconsciousness of image reception'* In 'Blind', one incision monstrously removes the eyes of the subject completely. 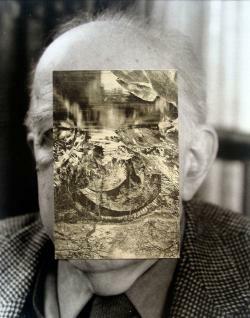 The 'Masks' continue Stezaker's ongoing interest with the hidden face. Found postcard images obscure and replace the subject's physiognomy, leaving a 'surround' of hair, neck and clothes. 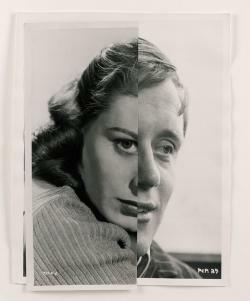 Playing with ideas of cubism and caricature, Stezaker's series of black and white portraits fuse male and female faces, reflecting the idea of marriage and hybrid symmetry, but also a discord of union. Perhaps the most subtle of found image alterations are the 'Reclined' series; a portrait of a standing woman is simply rotated ninety degrees and presented as a horizontal image to beautiful and unsettling effect.